Okay, first off this is an intervention of a food hoarder, and I am not going to fix my problem over night, so it would make sense that I would add new items, even as I am trying to clean. Well this item went straight to our bellies so I am pretty sure I broke even with this one. Last weekend we went to a vegan pot luck where the chef and creator Imber Lingard of Vtopian Artisan Cheese was there with a platter of cheese. It was AMAZING!!! We are fortunate to have a store in Salem, Oregon that carries it so hubby went and bought us a brie because we couldn’t stop thinking about it. So the shininess on the cheese is the wrapper. Unfortunately, the one I took with out it was too dark. Make sure to check out their site for better pictures. The texture was creamy and like real cheese. Plus, no weird aftertaste. We will be buying more. A lot more! This cheese alone is a reason to come to Oregon. Or try to get your favorite vegan supplier to stock it. You can also find it in stores in Berkley, Seattle, and Denver. Read more about the locations and Vtopian here. Or have them shipped to you. Find out more here. My first taste of vegan cheese was another brand of cashew cheese, and it was delicious!! Dr. Cow. Unfortunately, I’ve never run across it in Maine. I wish WF’s or TJ’s had more varieties to choose from…. I’m so envious of this cheese! It looks amazing. I wish we could get vegan cheese like this is Scotland. 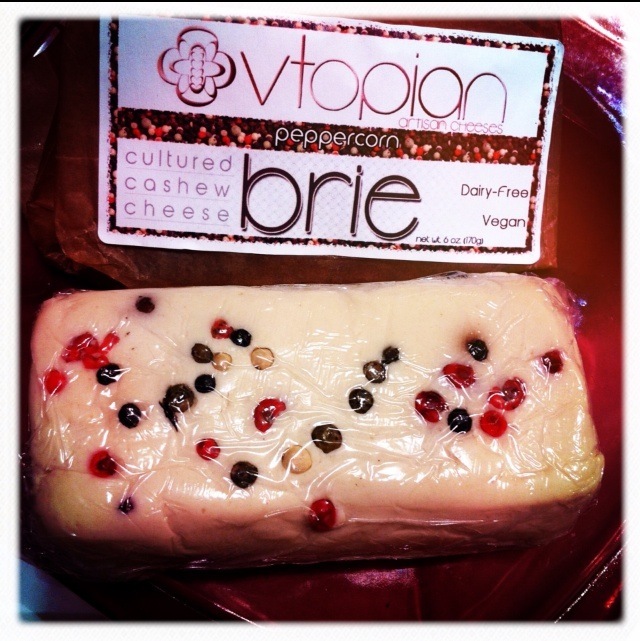 They are so delicious, the peppercorn brie is one of my favorite brie flavors! I’ve tried the spicy cheddar and didn’t love it, but I need to try the brie! I can’t wait for some more artisan cultured vegan cheeses to come to australia. I am so desperate to eat them! Oh yum, I can’t wait to try that one day!